Uneven frets can cause buzzing. Almost every player understands that. Uneven frets will generally cause buzzing at certain positions. For example, a guitar that buzzes only on the fifth fret is likely to have a low fifth fret or a high sixth. If an instrument buzzes throughout a general area or over the entire fingerboard, the cause is unlikely to be just uneven frets. The frets above are worn under the treble strings because the steel treble strings cut into the softer fret material. The brass winding on the bass strings is actually softer than the frets, so there's much less wear on the frets under the bass strings. Look at the deep grooves worn under the bass strings. Just about the ONLY way the bass strings can wear out frets faster than treble strings is with heavy use of a capo. The capo holds the string down more firmly than fingers can, and the string vibrates longer, wearing faster. By alternately pressing the ends of the straightedge, I can feel it "rock" across a high fret. Now, it's possible that my straightedge might be rocking down to touch a low fret as well. It doesn't take long to identify whether I'm dealing with a high or low fret, and most of the time I can look under the straightedge and see what's going on. The "best" fix for uneven frets is to remove them all, level the fingerboard and refret. That's the most expensive fix as well. Often, a loose fret can be glued in place. A low fret can be raised slightly and glued in place, too. 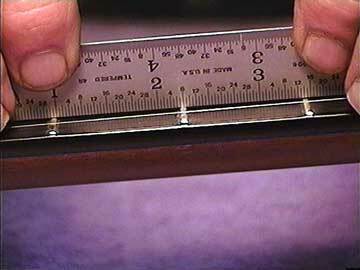 Uneven frets can be corrected by leveling all the frets, sanding or filing their tops just a little, then rounding them to their original profiles. Individual frets or groups of frets can be replaced. In each case, it's a matter of judgment as to which method of repair is most appropriate.